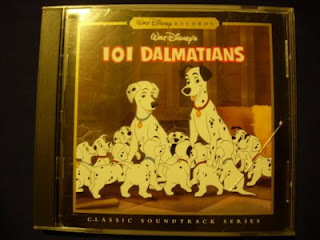 This is a picture of my Walt Disney Records soundtrack of the motion picture "101 Dalmations". This was an extremely hard-to-find compact disc, that I was fortunate to get at an NFFC Convention at a good price. I was working at The Disney Store during the time that this CD was released, yet our store NEVER got this CD, and I wasn't are of any of the other stores getting it either. I also never found this CD at Disneyland. The NFFC Conventions, which are held in July and January in Garden Grove, California, are great places to find the best Disney treasures. I was happy to get this CD because it expanded my already large collection of Disney soundtrack CDs. The music from this film was really good, too. I especially like the "Canine Crunchies" commerial music, and the "Cruella De Vil" song.